For decades, the Year's Best Science Fiction collection has been the most widely read anthology of its kind. Now, after thirty-five annual volumes, comes the ultimate version of the anthology. With more than 700 pages and featuring 38 thrilling tales, this epic edition gathers the most essential stories from the anthology’s long history—including work from Eleanor Arnason, John Kessel, Sarah Monette, Michael Swanwick, John Barnes, Elizabeth Bear, Charles Stross, Pat Cadigan, and many more. 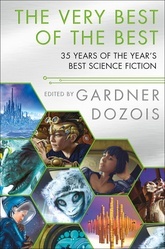 All the short stories in this landmark collection were selected by the late Gardner Dozois. A legendary editor, Dozois was considered a world authority on Science Fiction and celebrated for his work in the genre.